Lately I have been on twitter asking all of my garden followers can I eat sunflower, broccoli, or cauliflower leaves? All three plants produce amazing green leaves and it seems Mother Nature created them for a reason. Usually people just put the green leaves in the compost pail. Twitter Garden Pals, Shibaguyz, (“2 guyz lovin’ the life we’ve made for ourselves here in Seattle. Stop by our corner of the Universe and say hey!”) told me to prepare them like I would other greens. Hmm. This could be interesting. One of my other Twitter garden pals, Roy Stahl, creator of Plangarden.com software, told me he just throws his sunflower leaves in the compost. So, I thought, what the heck? I would experiment. What is the worse that can happen? I hate the leaves? As you can see from the picture above, the leaves of my giant sunflower are quite large. The stalk must have been six to seven feet tall. Large enough perhaps to create table mats if I was crafty. (The leaves reminded me of the Verterra leaf plates that I previous featured on Green Talk.) Could I have steamed them together to make plates or dried them like other leaves? Perhaps use a little polyurethane to make them into durable table mats? Anyone crafty have an opinion? Since crafty is not my middle name, I figured the only way to deal with them is to eat them raw or cook them. Large Sunflower leaves have a roughness about them so I knew eating them might be challenging. The leaves are not smooth like broccoli leaves. Being very brave or very stupid, whatever you think, I tore off a piece of the sunflower leaf, and stuck into my mouth. It did not have much taste. A little bitter like Kale and very chewy. After this experience, I decided to cook them. For some reason I had a problems finding good vegan greens’ recipes. Not one recipe caught my eye. Having struck out the first night, I decided to put the leaves in pitchers of water and vowed I would return to my search tomorrow. Tomorrow came and went. Last night, I noticed that the leaves started to look dried out. When I pulled them out of their large pitcher, all the water had disappeared. The leaves sucked the pitcher dry! I knew I had to cook the greens; otherwise they would be all dried out by tomorrow. Many of the websites that I visited told me to cook the greens in boiling water to remove the bitterness. The length of time depends on the type of green. You just have to experiment. Once I put a few greens into the water, the leaves turned bright green and the water started turning a golden brown color. After taking the greens in and out of the pot and rinsing them in cold water to stop the cooking, I finally decided that the sunflower leaves need about 15 to 20 minutes to release their bitterness. (You may find it takes less time.) Many of the websites indicated that the greens would taste sweet but I definitely did not think the sunflower leaves tasted sweet. To be honest it is kind of hard to describe them. They still tasted a little coarse and nondescript. I am not a greens eater so perhaps the taste is what a “green” tastes like. Readers? Thoughts? I reserved the cooking water to use for my plants. It reminded me of strong ice tea. Readers, would anyone drink the “greens” water? I heard that plants love it. My verdict about the sunflower leaves? Too tough and not much taste. Perhaps if I had cooked them in broth, maybe I would have liked them better. Any ideas? So what else did I do with the sunflower leaves? During my research, I found an interesting recipe on how to make vegan or vegetarian Kale “chips.” I decided to make the vegan recipe using nutritional yeast. Following the directions, I cut the leaves into four inch pieces, tossed with olive oil and apple cider vinegar according to the direction and sprinkled nutritional yeast over the leaf pieces. Then, I baked them at 375 degrees for 15 minutes. The chips were pretty good, but crumble easily since they are paper thin. The yeast gave them a tangy taste. I bet the Parmesan cheese option would have been better. I will definitely try this recipe with my Kale. how do you like to cook greens? Share your recipes. have you ever cooked sunflower leaves? What do you do with large leaves such as cauliflower or sunflower leaves? I know that the broccoli, or cauliflower leaves are quite nice. I usually boil them and serve with pepper salt. It is pretty nice. However, I’m not sure about the sunflower leaves. yeah, sunflower leaves has many herbal benefits, even oil extract of sunflower is used in cooking, its very beneficial for people who are suffering from obesity, its light to their heart. I would cool the boiled water in the frig so the oil hardens and should form a solid on the top. I imagine the crushed sunflower seed would have a use. The crushed moringa seed is used to purify water. I wonder if you can do this for pumpkin seeds as well since they are so big. What does their oil do? Sunflower oil is extracted from the ripe seeds; I’d imagine you’d need some kind of machinery. As for edible leaves, radish leaves and those of pumpkins and squashes are delicious, too. Apparently sunflower buds are good, and the petals of mature flowers can be used too. The buds taste a lot like artichokes and you eat them the same way. I didn’t know about the flower petals, but I’m going to try them! Anna, like a great many flowering plants, the removal of the primary flower bud not only will result in its replacement, but it will be replaced by several branches with new flower buds. In the case of sunflower, there are many varieties, some of which are very eager to branch out into multiple flowers, and some which will try to make one enormous flower, if left alone. But try this: in the case of one of the latter kind, wait until the bud appears, cut it off and eat it, along with a couple of small leaves, and watch the plant make many branches. The resulting flowers will be quite a bit smaller than the single flower that they replace. You can remove them, as well, and get a huge flush of bloom, maybe a couple dozen flowers, quite small. It may even be possible to go one more step with this, but I don’t know for sure. If the new buds all come in the leaf axils without any more branching, that is the terminal stage, since when they are removed there is nowhere else for buds to grow. I would post a photo if I knew how to attach it to this. About avoiding the shelling of the seeds – harvest them very early, very soon after you can see the flowers withering, indicating the formation of viable seeds. You will find that you can eat the remains of the flowers, any still-blooming flowers, and the immature seeds – in short, you can at almost the whole flower, except that the flower base and stem may be pretty tough by then. Again, don’t insult them by cooking them. Smitty, Wow. You saved me so much time. This year, a rabbit got to most of the leaves. They are growing back but I fear the flowers won’t amount to anything. The sunflower plant is usually the giant ones. At the end of July, it is only knee high and I am in zone 5. Is there hope? Sunflower plants are tough. If there is anything left of the plant at all, I should think it would grow and bloom. But about rabbits and critters eating, if they are eating 90% of your plants, and let’s say you want to have 10 plants for you, then you have to start with 100 plants. Two points: For salad, try eating sprouts. Sunflower seeds that you can buy super cheap as wild bird food will usually sprout – but may not be edible because the fields where they were grown were probably saturated with all the horrendous chemicals used in corporate agribiz. Grow some sunflowers and save the seeds. Won’t take long to have a lot of seeds. From time to time, sprout a plateful of them in wet paper towels maybe – you can look up various ways of sprouting seeds. From new sprouts just starting, to plants 6 inches tall, they are excellent eaten raw. You will get to like that mild bitterness of the young leaves. In my own case, I never cook them. I have read in an old naturalist, survival book where sunflower leaves , were recommended as treatment for diarrhea. Fortunately, I should say, have not had an opportunity to experiment with this, but have kept some dried leaves on hand if the need was to arise. I found a great source for cheap, sunflower seeds that sprout, is raw, organic seeds at the health food store. She said at a health food store. I had to read it twice to get it. Had the same thought as you the first time. if they really are organic, fine, but as I said in my earlier post, above, the way to be really sure is to grow sunflowers organically in your own garden and harvest the seeds. Nothing wrong with sprouting any viable seeds that you do find in the health food store, and of course it is fascinating to wait for the wild variety of flowers, every one a new surprise. Still, I like growing the named varieties. Sunflower seeds are never expensive at all, and some of the established varieties, such as Skyscraper (enormous plant, huge bright yellow bloom), are great to grow. I also like Evening Sun. I harvest the seeds from both, and since they are very probably self-pollinated, they tend to breed more or less true. Second-generation Evening Sun plants are big and vigorous and may have large brilliant red flowers. Plant more sunflowers. You cannot have too many sunflowers. Smitty, I figured out how to re-seed my sunflowers. Don’t cut them down and keep the heads with seeds for birds. They do all the rest of the work. 🙂 This year I had four large sunflowers growing on their own about 2 feet from the original planted one! I’m not sure I understand your first question. To me, ‘reseed’ means that you don’t have to plant those plants again the following spring, because they will come up from the seeds that fell on the ground in the fall. I think if you have a cold, wet winter that may not work out very well, because the seeds won’t survive the winter unless they are dry. Also, alternating cold and wet warmth may cause them to sprout too early, or to rot. In the case of the second question, the answer is ‘no’. I guess there are machines that do that, to produce the shelled sunflower seeds that you can buy, but I have no idea how they work, nor whether a small version exists for the home. Wouldn’t surprise me at all though. If it exists at all, somebody will be selling it on ebay. By the way, I liked Elizabeth’s suggestion about eating the flower petals, and I just went out and got some and ate them and they are indeed good, but I wouldn’t say their flavor is very impressive. Just very slightly spicy – I reckon they would go well in a salad. Eating them alone, after several of them you begin to get a slight bitterness. For that reason, I think I will make tea out of some petals. I’d like to refer back to the business of the leaves being tough and bitter. This is true in general of a great many such leaves, and it just means you picked leaves that were pretty well mature. Get the young tender leaves. I still don’t like the idea of cooking them, but do as you please. My family had a nutty Aunt like most families do! She used to steam the leaves until slightly tender and then stuff them like grape leaves. She made a meatless version with (toasted sunflower seeds, slivered almonds, rice, onions and chopped scallions), or a veggie hash containing (diced potatoes,onions,carrots,different bell peppers, scallions and finely chopped nuts), and a meat version that had( lamb fresh spearmint,rice or bulgar wheat seasoned with cummin and cinnamon) then she would cook them like you do stuffed grape leaves. Season them to your taste. She used to serve them with Greek or Lebonese yogurt sauces or an oil and basalmic or wine vinegar dressings. Wow. I found them to be kind of tough to eat. I wonder if she takes them when they are young? Your Aunt sounds amazing. Hola he plantado una pipa y me ha salido un girasol, hasta hay todo bien, lo unico es que no me nace la flor es solo tallo y hojas peludas, es esto posible? Tardara en salir la margarita como yo la llamo? que provecho le puedo dar a la planta? I read 2 different articles, one in an old survival preparedness book, and another in some old Mother Earth News that suggest sunflower tea as a treatment for diarrhea. Acey, thanks. I get this is how they make tea leaves. I am really into tea leaves these days. People only look at the plant but forget the leaves are great too. However, some of them are poisonous for human such as tomato, potato, and eggplant. Funny thing is I hear plants love tomato tea. Anyone else know about this? I put a big leaf into my smoothie today (along with kale, grape, purslane, chard, and cabbage leaves) and couldn’t taste it at all. I wish I liked steamed greens more but I find I really like them much better disguised by fruit and ice. Does anyone have the nutrition breakdown for sunflower leaves? not brave–just sick of trying to deal with my compulsive eating on a psychological level. The smoothies have drastically cut my desire for the junk carbs. I don’t even know what kind of kale I have–I’m that new at this. I start with fruit -whatever’s in my yard at present–green grapes right now, then whatever fruit is getting too ripe from the store, then the kale, then a mixture of any of the above leaves including calendula, borage, romaine, endive, dandelion, burdock, hyssop, squash, and string bean leaves. Then a cup of chunked zucchini/yellow crookneck (because I’ve got a ton of it). A tablespoon of flax meal. Usually that’s it–but if it’s more bitter than usual–a packet of Truvia (stevia) or a T. of tart cherry juice. Now the deal breaker for me is the ice. After the mixture is completely liquified I add about 3 to 4 cups of ice and blend again. Without the ice–I gag. With the ice–it’s great. Believe me–if you had told me 6 weeks ago that I’d be eating all these leaves, I would have said you were crazy. I have a large yard with all these plants and like to garden so I’m planting more greens (komatsuna, collards, chicory, spinach, beets, sorrel) like crazy right now. I’ll look into that Russian Kale–thanks. I really like the suggestion of using them as a wrap for some sort of filling. It reminds me of Greek Dolmas if you were to add rice and aromatics for flavor. I also wonder if using them as a cooking shell in a way like corn husks or banana leaves might work. I’m thinking of making a “dough” out of toasted ground seeds and Yuca or Taro to produce something of a tamale. I’ve not tried them yet, but I’m harvesting the seed heads this week – and will experiment. Blanching them in a salted and sweetened liquid should help to extract some of the bitterness and compliment the tannins in the leaves. I wonder if you ferment them like grape leaves, if that would make them easier to work with. However, in my case, since I grow large sunflowers I would need a big fermenting jar! I will have to try the wrap idea too. wonder if you use several leaves and wrap like one would grape leaves how it would be. 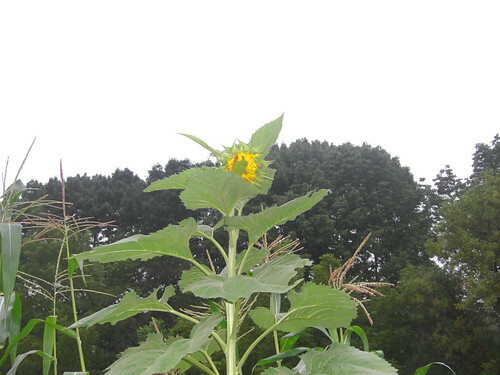 Right now I have sunflowers producing hundreds of beautiful daisy-sized flowers, looking like a tree of lazy Susans. I love them.. I will try the petals. I didn’t know you could eat the petals. What can I do with the big leaves besides compost? Plates? Forget about the leaves – it’s the greens you wanna eat! This was an extremely helpful article. Especially the comments section. I am determined to incorporate sunflowers into our diet this year (we have sooo many!!. Thank you for the ideas. I’ve found sunflower is a very green tasting green. We eat ours often. They’re better in Asian cuisine, with lots of soy sauce and other strong spices. The mild bittering blends well into dishes that have other strong flavors like ginger and tomato and curry. But, the texture is pretty rough, even then, so we slice them into thin strips. I tend not to dump the water out. That mild, green bitterness that spreads out into the dish, I think, is part of the health benefit of the green, and I’d prefer to soak it in, myself! I often use the leaves as green mulch, as well. I’ll walk through the garden and pop lower, older sunflower leaves to drop around the base of plants that like lots of minerals, like squash or tomato. It seems to help. I know it’s an old post, but hey, it was on the first google search page when I searched whether sunflower leaves are edible. I tried them cooked like grape leaves: stuffed with rice, parsley, tomatoes, and onions mix. They tasted almost like the grape leaves (it’s really the stuffing mix taste because the leaves almost have no taste), but they had this sandy/coarse texture. Given their benefits and the good taste, I would cook them again the same way and recommend them. Add a pinch of bicarbonate of soda to your sunflower leaves and boil for 10 minutes and cook the way you cook spinach or pumpkin leaves. I like it when I cook with peanut butter or almond flour it becomes a bit creamy and don’t forget to spicy.